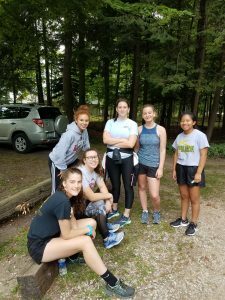 Heading into its third year as a team, the EC cross country team has been logging summer miles in preparation for the season. In order to attend the annual team camp, runners were required to report a minimum of 50 miles run in preparation. 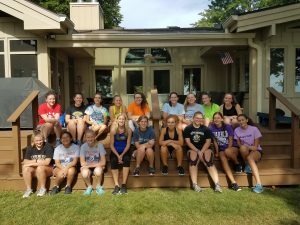 Seventeen girls met the requirement and headed to Elk Lake in northern Michigan the last week of July. Head coach Mary Williams and EC formation instructor Miss Rose Wieber accompanied the team. 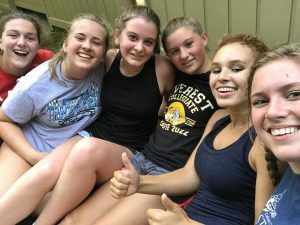 At camp the girls participated in twice-a-day workouts, logging a total of 25 miles each over the days they were at camp. 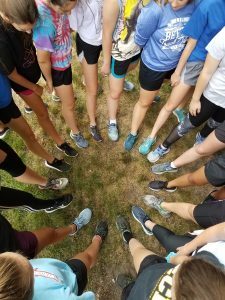 Team members participated in daily theory sessions learning more about motivation, mental strategies, running form, and studied some famous cross country teams and runners. Each day began with morning prayers and ended with night prayers, and the team attended Sunday Mass together at Christ the King Catholic Church in Williamsburg. 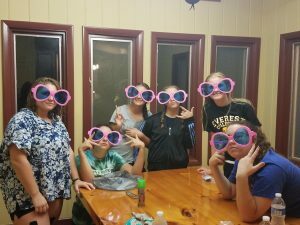 Afternoons and evenings were dedicated to team building activities including “Elk Lake Olympics,” game night, and a move night. On the final evening, the team had opportunity to share their reflections around the bonfire about how they had grown as a team and what they had learned about themselves during the camp. Their comments reflected new-found awareness of their own abilities as well as a great appreciation for each member of the team. The team is looking forward to a great season! Go Mountaineers!